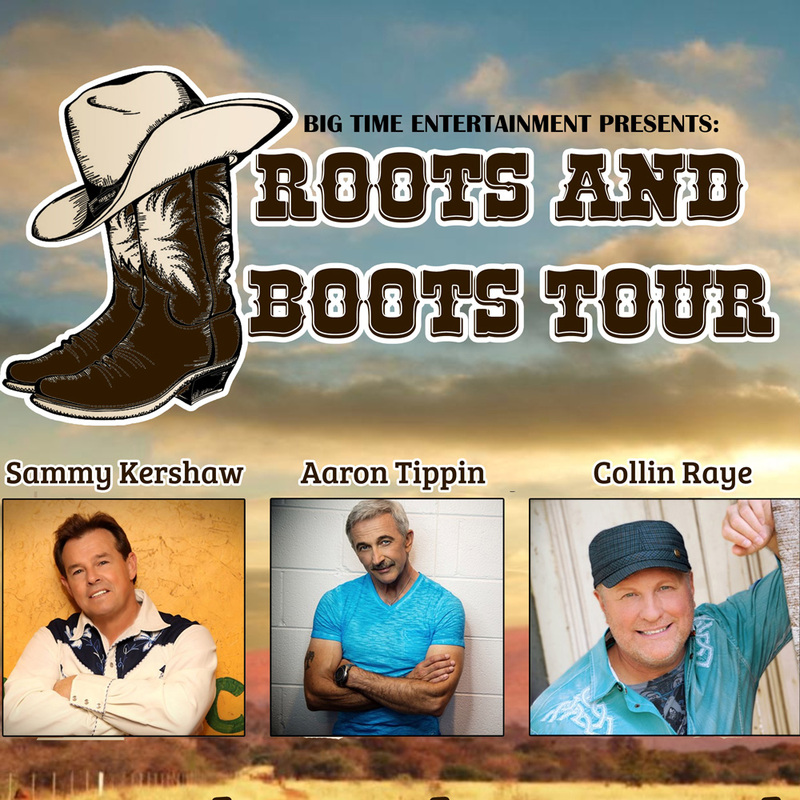 Roots & Boots – An evening with Sammy Kershaw, Aaron Tippin, & Collin Raye! An Evening with Sammy Kershaw, Aaron Tippin & Collin Raye! With “Special Guest Opener” Tom Tippin! 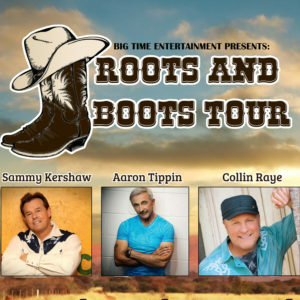 Three of the voices that defined 90s country music – Sammy Kershaw, Aaron Tippin and Collin Raye – join forces in the Roots & Boots tour. Combined, the trio has amassed more than 40 Top 10 radio smash hits and sold more than 25 million albums. Don’t miss these iconic country artists as they come together to swap stories and perform their classic songs all on one stage. In the course of breaking into the ranks of stardom in country music, Sammy Kershaw has made contributions to more than just the charts. His Platinum albums were propelled into the record books by hits such as She Don’t Know She’s Beautiful, I Can’t Reach Her Anymore, National Working Woman’s Holiday, Love of My Live, Cadillac Style, Don’t Go Near the Water, Haunted Heart…and many other milestones. Aaron Tippin has crusaded for the working man and woman since he ripped country music wide open with his uncompromising single You’ve Got to Stand for Something. His voice continued to ring loud and clear with such hits as I Wouldn’t Have it any Other Way, There Ain’t Nothin’ Wrong with the Radio, That’s as Close as I’ll Get to Loving You, My Blue Angel, and Kiss This. Five of his albums are certified gold and a sixth CD, Read Between the Lines, stands at the platinum level. Tippin’s honest lyrics and direct, impassioned vocals have built a large and devoted audience. Collin Raye is nothing if not passionate. His soulful delivery has set country standards in such searing ballads as Love, Me, In This Life, Not That Different and If I Were You. Always an energizing showman, he has also blazed through such vivid rockers as My Kind of Girl, That’s My Story, I Can Still Feel You and I want You Bad. With 24 top ten records, 16 #1 hits, and having been a 10-time male vocalist of the year nominee (5 CMA and 5 ACM), this truly electrifying performer of his era remains one of the great voices of our time. Tom is the son of country music star Aaron Tippin and is a talented rising star himself! Experience the Greensburg arts scene during ArtsWalk, a day of discovering the visual and performing arts our town has to offer. Pick up your roadmap at Courthouse Square and set off on a self-guided walking tour of downtown Greensburg. Explore the work of local, regional and national artists at each stop, including Westmoreland Cultural Trust’s Incubator for the Arts, The Westmoreland Museum of American Art and their Art Happens locations, Seton Hill University’s galleries and Art Yard, DV8 Espresso Bar and Gallery and more. After composing Carmina Burana, Orff said “Everything I have written to date, and which you have, unfortunately, printed, can be destroyed. With Carmina Burana, my collected works begin.” Written between 1935 and 1936, it remains one of the most recognizable and popular works in the classical repertoire. Two nights of the Year’s Most Exciting High School Musical Theatre! The following performance order subject to change. Penn Middle School: Peter Pan Jr.
Monessen Jr/Sr High School: Grease! “Songs for a New World”, the first musical from Tony Award-winner Jason Robert Brown (Parade, The Bridges of Madison County), is a moving collection of powerful songs examining life, love and the choices that we make. Becky Ziegler Koch will direct. All who purchased tickets for Sister Act are encouraged to retain their original tickets for this alternate production: same dates/same location/same seats, May 2-4 at Greensburg Garden & Civic Center. Full refunds will be granted upon request through the point of purchase beginning Tuesday, April 2. We apologize for any inconvenience, and hope to see you at GCT’s final production of their 67th Season! Join Animal Friends for a spectacular evening including food stations from all your favorite restaurants, a celebrity dance competition and an “after party” that hosts desserts, music, dancing, and lots of fun! River City Brass closes their 37th season with a trip to the islands. Get ready for summer with a collection of tunes that are sure to turn up the heat! The third annual Griffin Sports Awards will be held on Monday, May 6 to commemorate the outstanding accomplishments of the student-athletes at Seton Hill University. For the first time ever, the event will be open to the public for only $10 per guest. As a reminder, this is a semi-formal event. Critics, fans and fellow comedians agree: Brian Regan is one of the most respected comedians in the country with Vanity Fair calling Brian, “The funniest stand-up alive,” and Entertainment Weekly calling him, “Your favorite comedian’s favorite comedian.” The perfect balance of sophisticated writing and physicality, Brian fills theaters nationwide with fervent fans that span generations. A special 50th-anniversary concert event! Hear all the greatest movie music from legendary composer John Williams. The winner of 24 Grammy Awards and five Academy Awards, his most famous movie scores include Star Wars, Jaws, Superman, Indiana Jones, Home Alone, Jurassic Park, Harry Potter and many more! Mega platinum WHITESNAKE, the legendary rock ‘n’ roll band founded and formed by DEEP PURPLE singer DAVID COVERDALE are proud to announce their first shows of the 2019 “FLESH & BLOOD” World Tour, which will feature songs from the new studio record to be released on Frontiers entitled “FLESH & BLOOD” alongside their biggest hits & songs from one of the greatest back catalogues in rock ‘n’ roll history spanning over 40 years. International singer, storyteller & Comedian Cahal Dunne brings his Grand to Be Irish show to Lakeview for an entertaining afternoon. Enjoy lunch, music and stories of Ireland! Westmoreland Cultural Trust is proud to continue the tradition of acknowledging the creative endeavors of 72 area high school seniors for their exemplary skills in theatre, visual arts, instrumental music and vocal music. Along with other notables, Judge Jim Silvis and Judge Megan Bilik-DeFazio will be in attendance to personally recognize each student on the historic Palace Theatre stage. New this year, a representative from the Westmoreland Museum of American Art and the Westmoreland Symphony Orchestra will pass out the awards for their perspective categories (art and music). Students will also receive a commemorative pin, pen and complimentary bites and beverages at the pre-award ceremony celebration. Sandra Lynn’s School of Dance is committed to providing children and adults with the best possible arts education. The end-of-year recital includes performances encompassing all of their various classes and is an opportunity for students to showcase their hard work. Back by popular demand! For five decades The Lettermen have entertained audiences all over the world. The beautiful voices and distinctive harmonies of this singing trio first hit the music charts in 1961 with “The Way You Look Tonight.” Their voices blended as one, and after following that first hit with another chart topper, “When I Fall In Love”, they were voted best vocal group of that year. Enjoy a summer of live music for FREE every Thursday evening from 6 – 9:30 PM from May 30 – September 5, 2019 (no July 4th performance). The series will feature refreshing cocktails and enticing food options each week in the S&T Bank Courtyard and Megan’s Suite at The Palace Theatre (21 West Otterman Street, Greensburg) beginning at 4:30 PM with entertainment from 6 – 9 PM. In the event of inclement weather, the bands move indoors to Megan’s Suite. Stage Right’s Pre-teen students present Into the Woods Jr. featuring all of your favorite characters — Cinderella, Little Red Riding Hood, Jack (and his beanstalk) and the Witch — in this lyrically rich retelling of classic Brothers Grimm fables.